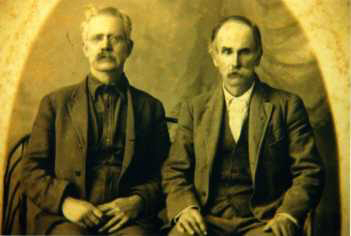 Thomas McKinney (brother of Martha Ann) and Ike Yoakum "Families surviving the hardships of the war were most often guided by a survivalist mentality. This meant the husband and father was, of necessity, little more then a dictator, whose good intentions were often questionable. It was the husbands responsibility to keep the family intact, provide for it, and most importantly to anticipate and look out for dangers. He was the LAW! There was no tolerance for anything that displayed weakness. " 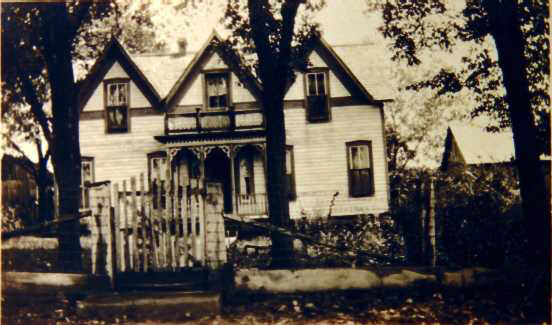 "I am told that the small structure on the right is where the entire family lived in the years before Ike constructed the nice house. My grandmother, Nellie Yoakum Shryock, told of carrying drinking water to the workmen while they built the new house. She was a girl of about 9 during the construction" - George Shryock. 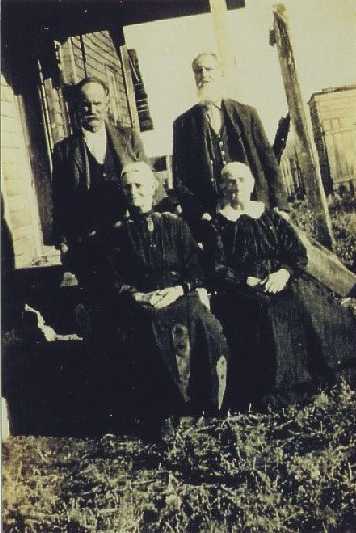 Ike and Martha Ann Yoakum, on left, with brother Jesse Yoakum and wife on right. ca 1919. "Ike's house stood the test of time and ravages of severe weather for many decades. Sometime after World War II a storm heavily damaged the upper floor and the repairs included complete removal of the 2nd story. " "Ike was a blacksmith and skilled carpenter and built, or rebuilt, every structure on his farm. He also helped construct a simple log cabin for use as the first White Rock school. Ike's father, Isaac, taught penmanship in the little White Rock School. " 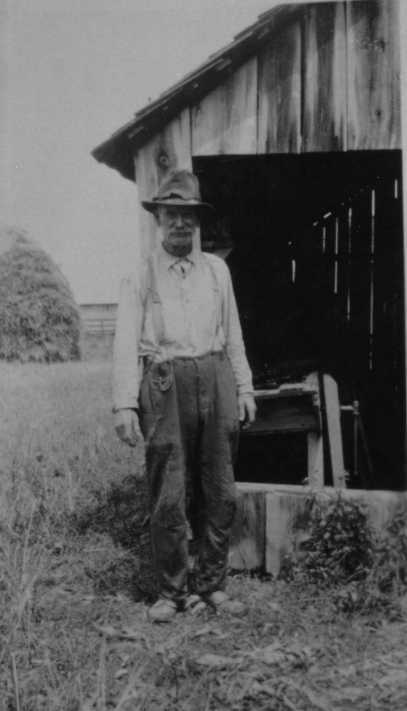 Ike's father Isaac YOAKUM is listed in the 1830 census as son of Sharlotte Yoakum in Roane, Co. TN. He is listed in the 1840 census as head of household living in Bradley Co., Tennessee. Simon 1, T T, Br-715-379. Note: Ike wasn't born yet! Charley S. and Alpha Clark Yoakum "Several generations of Yoakums experienced some kind of tragedy. 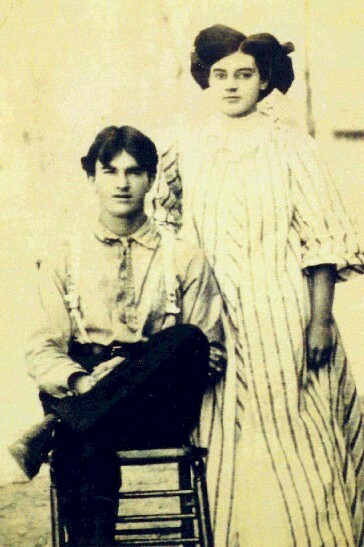 Ike and Martha Ann's son Charles Yoakum married Alpha Clark, daughter of Met Clark. Charlie and Alpha had a son named Delmar, a boy of about 12, who went on a hunting expedition in Wyoming. It began to snow and the group decided to return to camp while visibility was still good. Delmar lagged behind and lost sight of the others and they of him. All of them finally made it back to camp except the boy. He froze to death during the storm and his body was not recovered until the following July. It was said that Delmar's body was perfectly preserved, even free of any kind of discoloration. And the story is that Delmar was buried on or near the mountain he loved."